A full featured Chartplotter the GO 5 offers a 5" Multi-Touchscreen, fully customizable display that can provide shortcuts to your most used features. Preloaded with Insight Mapping for the US, the GO Series can be enhanced with C-Map Max-N, Navionics PLUS, Navionics Platinum Pus, Hotmaps Platinum, Insight Genesis and NV Digital Charts ensuring there is a map for your every need. The Internal 10Hz GPS Receiver shows your position and updates 10x per second for a more fluid onscreen movement and allows you to mark Waypoints and create Routes with ease. TripIntel Software for power boaters is also included in the GO Series displaying pertinent information for a safe day on the water. View current and future tide levels, even see a detailed history of trips and routes you took. The Internal Sonar in the GO Series offers CHIRP, DownScan, StructureScan and ForwardScan Capabilities. The included M/H/DS Transducer that comes with this specific Go 5 will provide M/H CHIRP and DownScan Sonar which shows near photo-like images below your boat. You can further enhance the detail you see ahead with an optional ForwardScan transducer which will provides a clear two-dimensional image of the bottom in front of your boat. A top Choice, Reliable combination GPS/Fishfinder - Simrad's complete GOXSE line of units fits the bill and are sure to not disappoint! 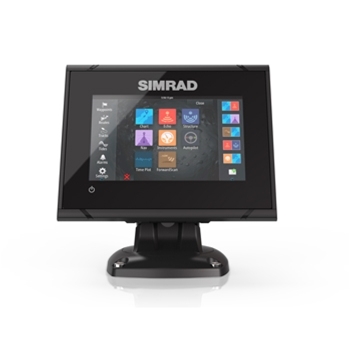 Each Simrad GO5 XSE comes with: Simrad GO5XSE, C-Map Insight Pro Chart Card, Quick-Release Bracket, Suncover, M/H/DownScan Transom Mount Transducer, Bezel, Power/NM2K Cable, Dash Mount Kit, Documentation and a Two-Year Warranty.